Made from sustainable olive wood that has been harvested from trees that are no longer fruit-bearing or oil-producing, the Olive Wood Floating Wine Holder is a beautiful addition to the dining room table or kitchen. Each wine holder is hand-finished, and variations in the wood grain make each piece totally unique. Presented with the bottle of wine of your choosing, this is a perfect gift for any wine lover. One Olive Wood Floating Wine Holder. "Good" Version Includes: Mt. Josselyn Reserve Red. "Better" Version Includes: Concannon Founders Cabernet. "Best" Version Includes: Decoy Zinfandel. Your selection of three initials or a monogram engraved on wood surface. Enter information to be engraved using the personalization option during checkout. Measures 12" x 4" x 2". Olive Wood Floating Wine Holder with Wine is a hand delivered gift. These gifts are delivered by one of our local design centers located throughout the United States and Canada. Same day delivery is available for most gifts when ordered before the cutoff time. 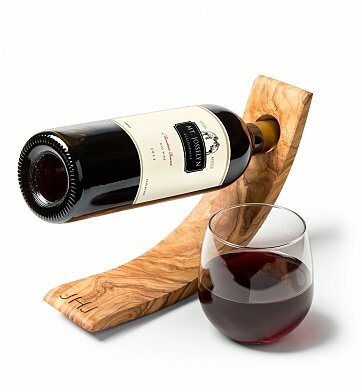 The cutoff time for Olive Wood Floating Wine Holder with Wine is 2 PM in the recipient's time zone. Concannon Founders CabernetEnjoy rich aromas and luscious flavors of intense red cherry, ripe plum and black currant intermingling with hints of cocoa, vanilla and spice. Decoy ZinfandelA smoky, chocolaty red wine, ripe in blackberry and an accent of clove. Rich, it remains fresh on the palate, with soft, supple tannins and an easygoing, lingering finish. This balanced and food-friendly Cabernet Sauvignon is proudly made in part from Concannon Clones in Paso Robles, California. Enjoy rich aromas and luscious flavors of intense red cherry, ripe plum and black currant intermingling with hints of cocoa, vanilla and spice. A bottle of wine poises in the olive wood stand to balance horizontally. Naturally harvested solid olive wood floating wine holder. Presented with your selection of a bottle of California red wine. The marksmanship and design was better than I had anticipated and the person that received the gift was thoroughly impressed. Thank you for helping me do right with this gift.